I’m in the middle of getting things done for the nursery and with the warning in the back of my head that babies can be born a couple of weeks before the due date, I’m trying to get it all done in the next couple of weeks. Not that the stuff that I’m making is essential for the survival of our offspring or for my own physical wellbeing. It’s because sewing and crafting one of those activities that help me deal with the completely normal anxiety that is part of the whole ‘creating a person’ process. As long as my hands are busy, my mind is calm. All the nursery and baby stuff gives me a good excuse to buy all the cute printed fabric that I love, but didn’t have a use for before. Kuddo’s to all the costumers and crafters out there who use printed cotton fabric to line their bellydance costumes, like Ozma and Andalee. It looks so cute to have pretty printed fabric lining a sparkly bellydance costume! I prefer lining my costumes in neutral colors so I kept on looking at all the pretty fabrics and thinking about all the wonderful stuff I could make one day. That day has come!! For the record, this blog is not a tutorial, but a talk through the process that I used and some tips. 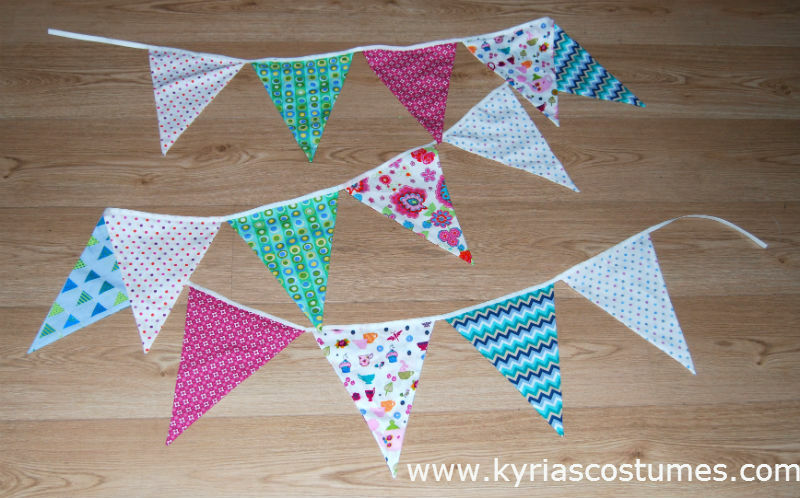 Buying fabric bunting in stores is very easy: they have a lot of variations at low prices. I prefer to make my own because and because I don’t want to support a system where people in sweatshops work in bad circumstances. I strongly feel that a fun item for a festive occasion like the birth of my child should not be made by child labor. Plus, even if it doesn’t involve child labor, the quality of the material and workmanship of store bought items is different from my home made projects. I enjoy making my own because I can make bunting in the color, length and quality that I want. Did I mention the fabric shopping? Anyone who sews or crafts know that buying supplies is absolutely necessary and that at least two to three times the amount of materials sh0uld be bought of what is actually needed for the project. I have a craft room that’s stuffed to the brim because of this. At the local fabric market I bought a couple of small fabric coupons (0.5 x 1.4 m) of the Stenzo printed fabric selection. I picked colors that match the pink, turquoise and purple of the wall decal in the nursery. I used eight different fabrics, matching thread and 3 m of white bias tape, 1 cm/ 2/5″wide. Most of the matching thread came from my stash. 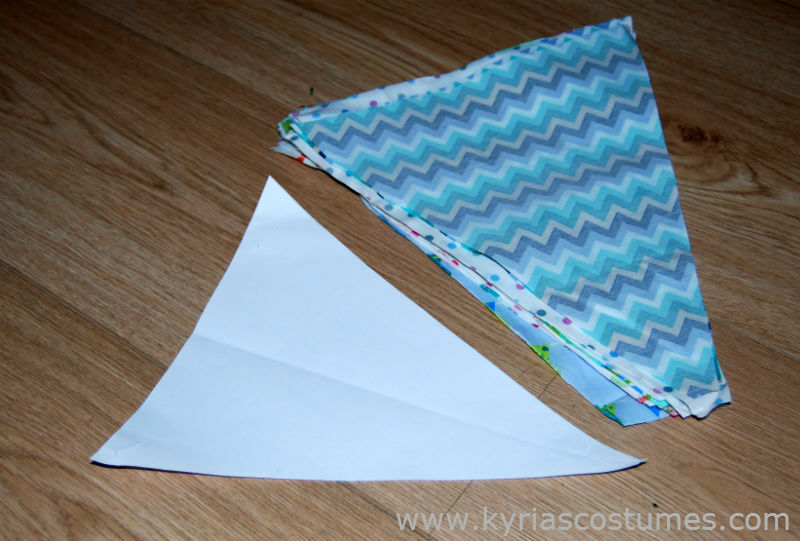 I created a template by cutting a triangle out of a blank piece of paper and cut two flags of each fabric. My bias tape is 3 m so that should be enough to get one line of bunting done. I cut sixteen flags but ended up using fourteen because I left a piece of bias tape empty at the ends so it can be tied or pinned. I sewed the flags together with the right sides facing inward, then turned the flags inside out. My kitchen drawer held a sate skewer that was perfect for pushing the point of the flag completely outward. I like to do this type of craft project on intuition, since measuring takes a lot of time compared to laying stuff out by eye. For the record, for garments and other items that require a good fit, I’m always going crazy with the measuring, cutting and seam allowances because in those cases every mm counts to get a good fit. One of the most important steps for a neat end result is pressing. I use an old iron to press fabric while I sew, because sometimes icky stuff get’s stuck to the iron when using Vlieseline. Besides pressing the flags, I also folded the bias tape so it was already creating a neat line. 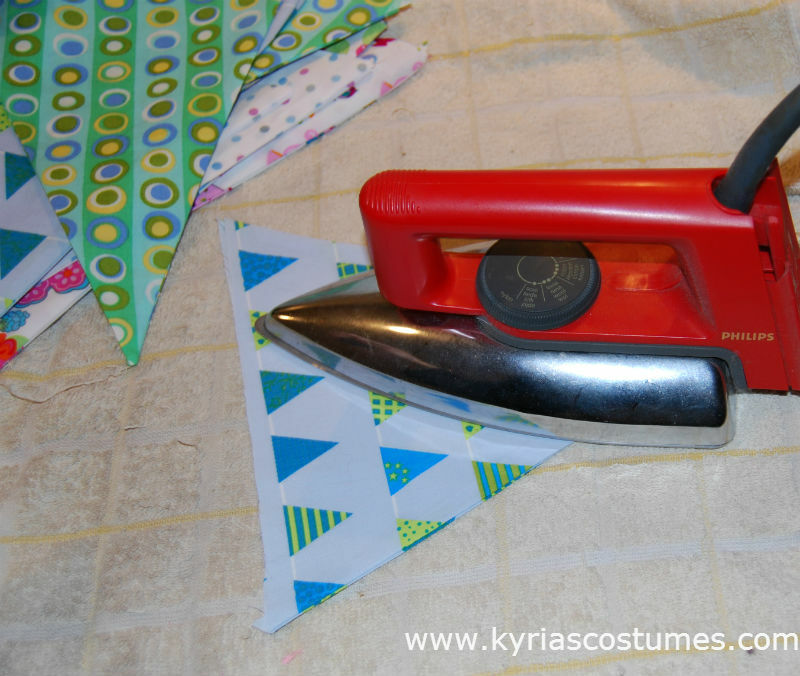 This really helped with the pinning and sewing of the bunting and I highly recommend it. While buying supplies at the fabric market I was adviced me to buy extra wide bias tape because 1cm/ 2/5″is quite narrow to work with. If you are inexperienced at sewing, use wider tape as it will be easier. I’d use 2 cm/ 4/5″ maximum, otherwise the tape would look rather clunky compared to the flags. Pressing cotton with my vintage Philips iron. It took me an evening to complete the bunting and I am rather pleased with the result. 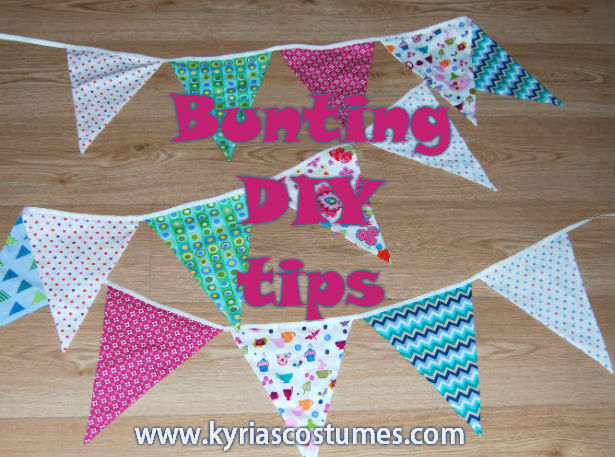 Before I show you the end result, here are my top tips for making a bunting. 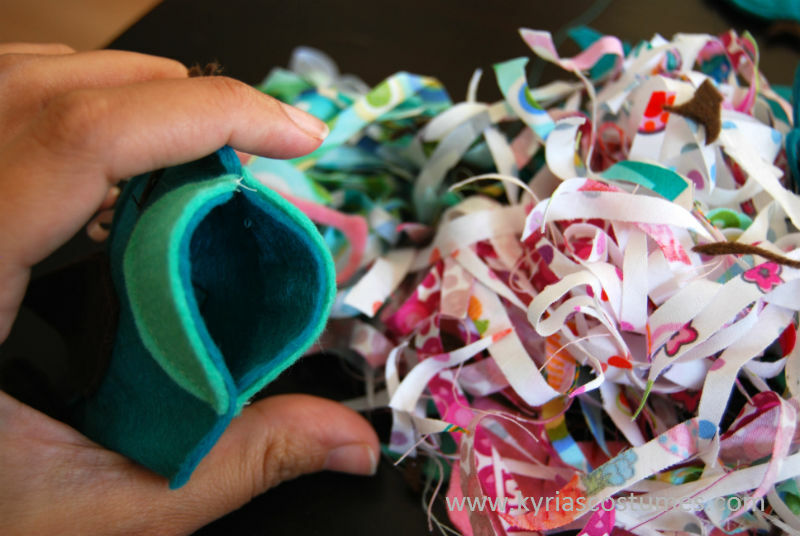 This little things go a long way in creating a bunting that is colorful, pretty and well made. Huzzah!!
. If you enjoyed this post and like to kept in the loop, please like Kyria Bellydance on Facebook or follow me on Twitter. Leave your questions or comments in the box below, or let me know through Facebook and I might write a blog post to answer your costuming question. I announced in my last post that I am taking a break on bellydance costuming due to maternity leave. Which means that I will be writing a bit about all the craft projects for the nursery, since I can’t seem to stop blogging. Writing makes me happy. Let me start out by saying that when I thought about the nursery, my first step was searching for images on Google. This resulted in tons of pictures of huge rooms, soft lush carpets, many drapes and flowing curtains and furniture that looked like it belonged in Versailles if only it had been gold gilded. And a chandelier, of course. I like how people around the globe put effort into the nursery and share their rooms on the internet, and it also made me think about what my own preferences are. For the record, my husband is very involved in the process and willing to do the painting assembling and such that is needed. He leaves the creative input to me, on account of me having all kinds of ideas of what would work and look nice. Our nursery room is the small bedroom next to our master bedroom. It measures app. 3×3 meters (that’s 10 by 10 feet for the US readers). I want it to be cosy, practical and cheerful. Since I am kind of lazy and we have so many other things to do, I try to keep the amount of work needed to decorate the room limited. My first step was choosing a wall decal as a focal point in the room, and coordinate a color scheme around the decal, which we did. 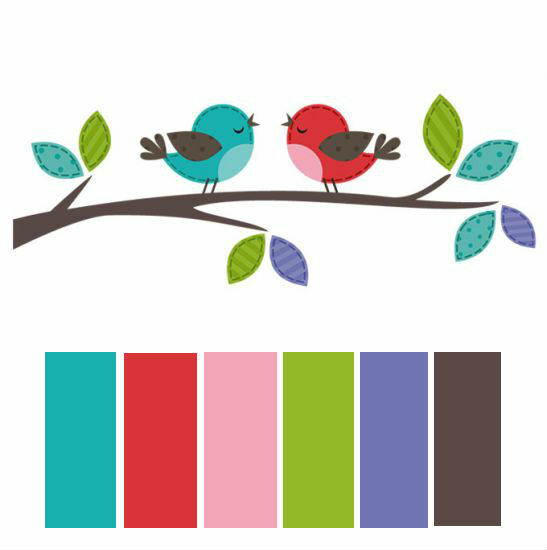 We picked an adorable wall sticker of a branch with two birds in red/turquoise/purple. I used Photoshop to draw the color samples underneath the image, printed it and took it with me to the fabric market. If you need a quick photo editor, I like to use the online app Pixlr for quick on the go images. 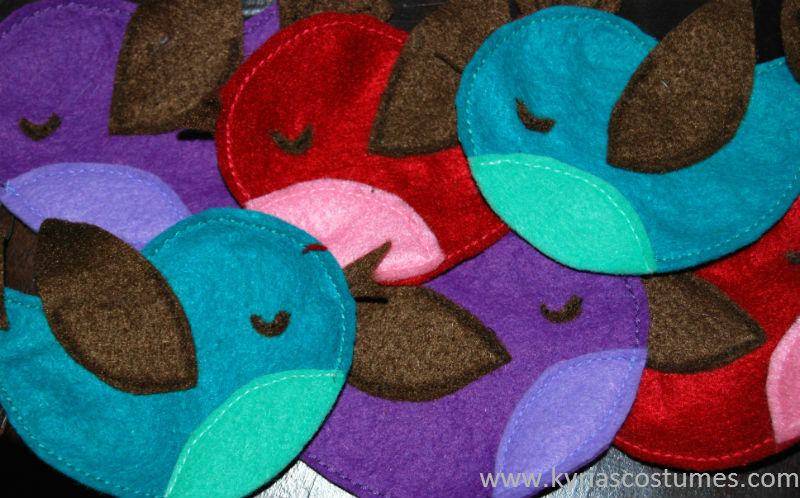 My grand plan is to buy felt and create similar looking birds. Some of them will be stuffed and others will be used as appliques. Print and use a photocopier to scale the bird up or down. With hanging felt ornaments in mind, I copied the pattern at 73%. 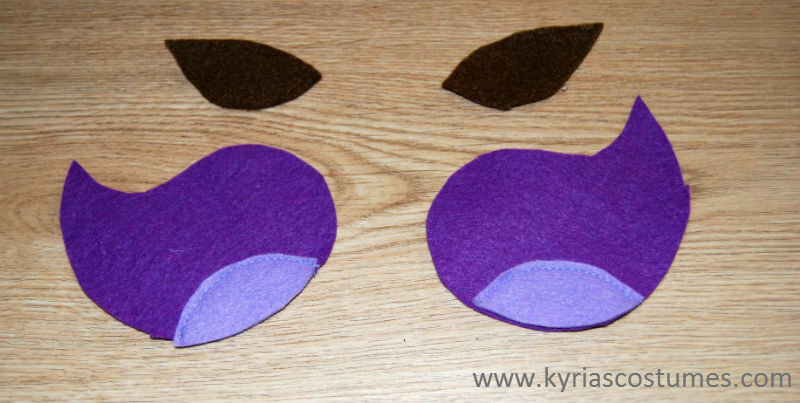 The regular pattern is suitable for creating a small plush toy or a larger applique. I paid roughly 10 euro for all the supplies, enough to create a whole flock of birds. For the Dutchies: Hema has nice packages of felt at a good price. They sell it in different color combinations in their craft corner. If you are using this item in a nursery and you are concerned that the baby will grab these and play with the ornaments: pre wash your materials to remove remains of dye and chemicals from the felt. Make sure to use strong, sturdy stitches and don’t add small buttons or beads as eyes. I made one bird to try out the process. Felt is easy craft material as it doesn’t fray, holds up well and looks good. If you have never ever sewn or crafted anything in your life, I highly recommend starting with a felt ornament or applique. You can easily make these by hand but I used the sewing machine because I have Big Plans. It would look extra nice with hand stitching and embroidery thread. Cut all the pattern pieces and layer them on top of each other. Stitch the belly onto the body of the bird. Take the wings and the eyes, and stitch them to the body. Make sure to use the same angle for the wings on both sides: l ayaer the birds on top of each other and pin the wings into place. Stitch, starting about 5 mm from the edge of the body and stopping 5 mm before the other edge. This allos you some room to fold the wings out of the way for the next step. In order to sew the two sides of the birds together, I pinned the wings out of the way and added the beak and a small piece of ribbon folded over. I then stitched all around the body. I used a thicker machine stitch for this step, as I wanted to create a bit of contrast and make the stitches more visible. On to the stuffing! I saved all my scraps from another project and added the felt scraps from the birds. I cut it into small pieces and used it to stuff my birds. You can use batting for this step if you prefer. Cut off extra material from the outside of the body to create a smooth line. 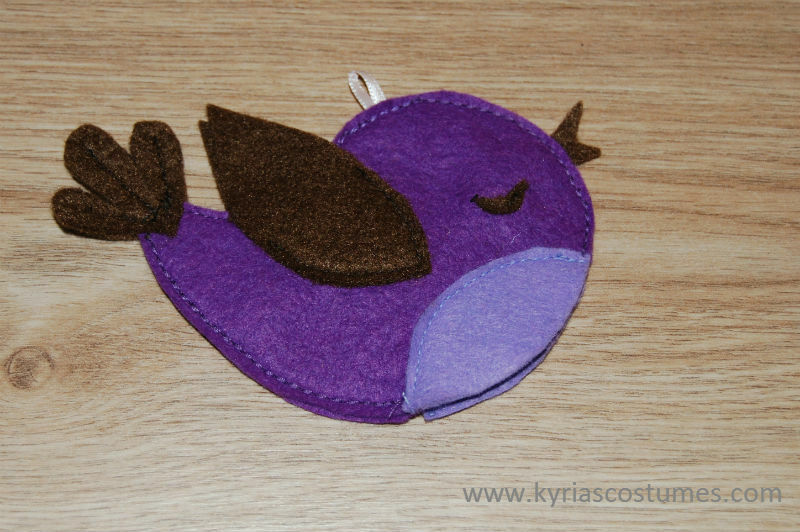 Close the bird by stitching the belly together, either by hand or machine. That’s it! I’ll post some more pictures when I’ve used the birds in the nursery, but so far I found them rather cute all by themselves. 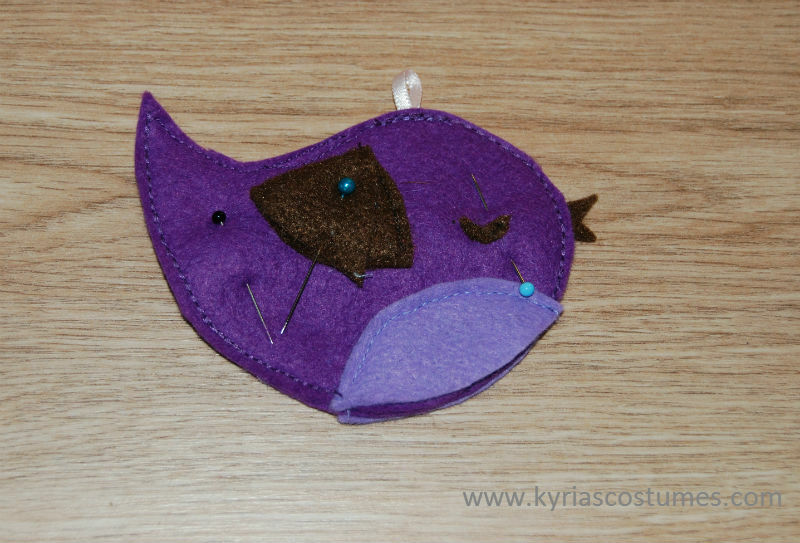 If you prefer applique’s, use the tutorial but skip the step for sewing two sides together and stuffing the bird. The project was time consuming because there are a lot of tiny seams and curved edges but I am rather pleased with the result. I plan on making turquoise and purple birds as well and use them at various places in the nursery. One more week of regular work and then I’ll be on the couch, binge watching series and crafting more nursery stuff. More crafting is on the way and I already bought a lot of super cute printed fabric pieces for other nursery projects. I am a professional bellydancer and costume-a-holic living in the Netherlands. I’ve been sewing and crafting stuff for over twenty years now and have no intention of stopping. If you enjoyed this post and like to kept in the loop, please like Kyria Bellydance on Facebook or follow me on Twitter. Leave your questions or comments in the box below, or let me know through Facebook and I might write a blog post to answer your costuming question.